– As MCA Universal prepares a preemptive strike against America’s most important recent history—the public assassination of one of the original American Drug Lords in a movie starring a world- famous Scientologist playing a man outweighing him by a good hundred pounds—it may be time to stand up for what’s left of the truth. Its a picture that changes your worldview. It has historic significance. A young Porter Goss, in a photograph of Cuban exiles, Italian wise guys, and square-jawed military and intel types who look exactly like you’d expect a secret CIA assassination team to look. It’s like finding a snapshot of J. Edgar Hoover wearing a peach sundress and matching lipstick. You’re a little surprised. But not shocked. Still, once you’ve seen it, its impossible to forget. 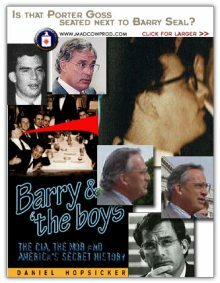 The picture turned up during research for “Barry & the boys” in a safe overlooked by a 7-man “clean-up” team from the U.S. State Department, who British journalist and author Ambrose Evans-Pritchard reported had been assigned to comb through Seal’s records at the home of his widow in Louisiana. Ahead of Bill Clinton’s 1996 Presidential re-election campaign, in 1995, rumors circulated that Seal’s friendship a decade earlier with the then-Arkansas Governor—during Seal’s not-terribly-covert aviation supply operation out of Mena Arkansas, arms down, cocaine back—somehow posed a threat to his campaign. In 1963, Barry Seal (on the left, third from front) was just 24, yet already a veteran CIA pilot. Sitting beside him (second from left) is Porter Goss. Next to Goss (front left) is notorious Cuban “freedom fighter” Felix Rodriguez, whose identity in the picture was so obvious that death threats wafting in from his general direction proved unavailing. Rodriguez will later go on to fame as an Iran Contra operative and close confidant of then-Vice President George H.W. Bush. Before he got all Cuba Libre-y he’d been a vice cop in Havana—a vice cop in Havana!—during Batista’s Mob-run regime. Covering his face with his sport coat on the other side of the table is the only Operation 40 celebrant displaying any regard for tradecraft. Frank Stugis couldn’t stretch his sport coat high enough to cover his swept-back “Big Wave in Hawaii” pompadour, though he gets points for trying. A decade later he’ll be one of the Watergate burglars, and, perhaps unsurprisingly,he’s also strongly suspected of involvement in the JFK assassination. The man beside Sturgis (front right) closely resembles William Houston Seymour,New Orleans representative of the Double-Chek Corporation. Unlike others of the spook superstars at the table, I received no confirmation about Seymour. But if it is him, it would make sense. Double-Chek was a CIA front used to recruit pilots like Barry Seal, sitting right across the table. And Seymour has also been fingered by many Kennedy assassination researchers as the man who impersonated Lee Harvey Oswald during times when the original “lone nut gunman” was out of the country and couldn’t be there to impersonate himself. By the time of Goss’ confirmation hearings to become head of the CIA, the pic had been widely circulated over the internet. No one in America’s mainstream media ever pressed him about it. Then, too, to no fanfare, in fact to deafening silence, Mohamed Atta and the other 9/11 terrorist hijackers were using Goss’ Congressional District in Charlotte County, whose main city of Punta Gorda was founded by “retired” CIA agents, as a base of operations while they conspired to commit mass murder. Yet like apparatchiks on the podium in Moscow Square standing stoically in the cold, the Sons of Privilege toed the party line. “Rep. Porter J.Goss has disclosed precious few details of his CIA employment from roughly 1960 to 1971,” reported a profile in the Associated Press. Reuters called him a “mystery man,” and said he had been “close-mouthed about his past.” Well, duh. The creases in his jeans should have been a clue. Goss is the product of a patrician Connecticut upbringing, an elite prep school, and Yale University, the CIA’s unofficial alma mater. And he was in a secret society too: Book & Snake,according to author (Fleshing Out Skull & Bones) and publisher (Trine Day) Kris Millegan. So when Yalie Skull & Bonesman George W Bush “tapped” “tapped” “tapped” on Yalie Book & Snakesman ( Snakeshead?Snakes-person?) Porter Goss’ icy windowpane, naming him Director of the CIA, it said a lot. Conservatives will be pleased that what passes for civic life in America is still a game of Inside Baseball. Liberals will continue to ignore the issue. The “conventional life,” for a Yale graduates from a secret society like Skull & Bones or Book & Snake, may mean going to work for the CIA (or the intelligence industry in one of its many (shape-shifting?) forms. Its no less conventional a career choice than founding a computer start-up is for graduates of Stanford. Why else would anyone bother to learn the secret handshake? While in Congress, Goss often found himself paired with a fellow Floridian, Democratic Sen. Bob Graham, who as Chairman of the Senate Intelligence Committee led the joint Congressional Inquiry into the 9-11 attack. In fact, the two men were having breakfast together in Washington on the morning of September 11th, 2001, along with the head of Pakistani intelligence, a man later accused of wiring $100,000 to Mohamed Atta in the U.S. When, three years later, questions were raised as to just how it was both major party candidates in the 2004 Presidential election belonged to the same secret society (Skull & Bones, no less), there was a silence, and then a shuffling of feet. Maybe a cough or two. But no answers. Maybe I’m irony-impaired, and need to get down to GNC for some supplements… But while talking about weapons of mass destruction to a committee of the Congress of the United States of America, the U.N.’s chief weapons inspector cited—from deep left field and out of the blue—secret societies. Just how odd do things have to get before nothing seems odd anymore? March 29, 2017 in NARCO-POLITICS: Black Budgets & Black Ops.